In this study, solar energy potential of Mersin which is placed in Mediterranean region of Turkey was investigated by using meteorological data of Turkish State Meteorological Service and meteorological satellite (HelioClim©). A simple model to predict solar radiation was developed and compared with the other models published in literature. Proposed model estimated daily global solar radiation by using difference of maximum and minimum temperatures. Daily and monthly solar radiation data was estimated with 14.7% and 9.1% absolute mean percentage error, respectively. Almorox J., ‘‘Estimating Global Solar Radiation From Common Meteorological Data in Arajuez’’, Spain, Turk. J. Phys., 35, 53-64, 2011. Kılıç, A. and Öztürk, A., ‘‘Güneş Enerjisi’’, Kipaş Dağıtımcılık, İstanbul, 1983. Bulut H. and Büyükalaca O., ‘‘Simple Model For The Generation of Daily Global Solar-Radiation Data in Turkey’’, Applied Energy, 84, 477-491, 2007. Hargreaves G. H. and Samani Z. A., ‘‘Estimation of Potential Evapotranspiration’’, Journal of Irrigation and Drainage Division, Proceedings of the American Society of Civil Engineers, 108, 223-230, 1982. Zhang Q. Y. and Huang Y. J., ‘‘Development of Typical Year Weather Files for Chinese Locations’’, ASHRAE Transactions, 108, 1063-1075, 2002. Al-Anzi A., Seo D. and Krarti M., ‘‘Impact of Solar Model Selection on Building Energy Analysis for Kuwait’’, Journal of Solar Energy Engineering, 130, 0210041-6, 2008. ISNAD Arslan, Gökhan , Bayhan, Burhan . "SOLAR ENERGY POTENTIAL IN MERSIN AND A SIMLE MODEL TO PREDICT DAILY SOLAR RADIATION". 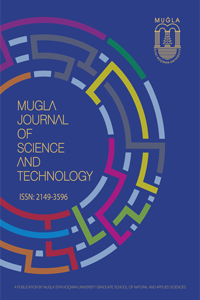 Mugla Journal of Science and Technology / (May 2016): 1-4.